Systematic reviews and meta-analyses are essential to summarise evidence relating to efficacy and safety of healthcare interventions accurately and reliably. The clarity and transparency of these reports, however, are not optimal. Poor reporting of systematic reviews diminishes their value to clinicians, policy makers, and other users. Since the development of the QUOROM (quality of reporting of meta-analysis) statement—a reporting guideline published in 1999—there have been several conceptual, methodological, and practical advances regarding the conduct and reporting of systematic reviews and meta-analyses. Also, reviews of published systematic reviews have found that key information about these studies is often poorly reported. Realising these issues, an international group that included experienced authors and methodologists developed PRISMA (preferred reporting items for systematic reviews and meta-analyses) as an evolution of the original QUOROM guideline for systematic reviews and meta-analyses of evaluations of health care interventions. The PRISMA statement consists of a 27-item checklist and a four-phase flow diagram. The checklist includes items deemed essential for transparent reporting of a systematic review. In this explanation and elaboration document, we explain the meaning and rationale for each checklist item. For each item, we include an example of good reporting and, where possible, references to relevant empirical studies and methodological literature. The PRISMA statement, this document, and the associated website (www.prisma-statement.org/) should be helpful resources to improve reporting of systematic reviews and meta-analyses. Unfortunately, there is considerable evidence that key information is often poorly reported in systematic reviews, thus diminishing their potential usefulness.3 4 5 6 As is true for all research, systematic reviews should be reported fully and transparently to allow readers to assess the strengths and weaknesses of the investigation.7 That rationale led to the development of the QUOROM (quality of reporting of meta-analysis) statement; those detailed reporting recommendations were published in 1999.8 In this paper we describe the updating of that guidance. Our aim is to ensure clear presentation of what was planned, done, and found in a systematic review. Terminology used to describe systematic reviews and meta-analyses has evolved over time and varies across different groups of researchers and authors (see box 1 at end of document). In this document we adopt the definitions used by the Cochrane Collaboration.9 A systematic review attempts to collate all empirical evidence that fits pre-specified eligibility criteria to answer a specific research question. It uses explicit, systematic methods that are selected to minimise bias, thus providing reliable findings from which conclusions can be drawn and decisions made. Meta-analysis is the use of statistical methods to summarise and combine the results of independent studies. Many systematic reviews contain meta-analyses, but not all. The QUOROM statement, developed in 1996 and published in 1999,8 was conceived as a reporting guidance for authors reporting a meta-analysis of randomised trials. Since then, much has happened. First, knowledge about the conduct and reporting of systematic reviews has expanded considerably. For example, the Cochrane Library’s Methodology Register (which includes reports of studies relevant to the methods for systematic reviews) now contains more than 11 000 entries (March 2009). Second, there have been many conceptual advances, such as “outcome-level” assessments of the risk of bias,10 11 that apply to systematic reviews. Third, authors have increasingly used systematic reviews to summarise evidence other than that provided by randomised trials. However, despite advances, the quality of the conduct and reporting of systematic reviews remains well short of ideal.3 4 5 6 All of these issues prompted the need for an update and expansion of the QUOROM statement. Of note, recognising that the updated statement now addresses the above conceptual and methodological issues and may also have broader applicability than the original QUOROM statement, we changed the name of the reporting guidance to PRISMA (preferred reporting items for systematic reviews and meta-analyses). The PRISMA statement was developed by a group of 29 review authors, methodologists, clinicians, medical editors, and consumers.12 They attended a three day meeting in 2005 and participated in extensive post-meeting electronic correspondence. A consensus process that was informed by evidence, whenever possible, was used to develop a 27-item checklist (table 1⇓) and a four-phase flow diagram (fig 1⇓) (also available as extra items on bmj.com for researchers to download and re-use). Items deemed essential for transparent reporting of a systematic review were included in the checklist. The flow diagram originally proposed by QUOROM was also modified to show numbers of identified records, excluded articles, and included studies. After 11 revisions the group approved the checklist, flow diagram, and this explanatory paper. Fig 1 Flow of information through the different phases of a systematic review. The PRISMA statement itself provides further details regarding its background and development.12 This accompanying explanation and elaboration document explains the meaning and rationale for each checklist item. A few PRISMA Group participants volunteered to help draft specific items for this document, and four of these (DGA, AL, DM, and JT) met on several occasions to further refine the document, which was circulated and ultimately approved by the larger PRISMA Group. We developed the PRISMA statement and this explanatory document to help authors report a wide array of systematic reviews to assess the benefits and harms of a healthcare intervention. We consider most of the checklist items relevant when reporting systematic reviews of non-randomised studies assessing the benefits and harms of interventions. However, we recognise that authors who address questions relating to aetiology, diagnosis, or prognosis, for example, and who review epidemiological or diagnostic accuracy studies may need to modify or incorporate additional items for their systematic reviews. We present each checklist item and follow it with a published exemplar of good reporting for that item. (We edited some examples by removing citations or web addresses, or by spelling out abbreviations.) We then explain the pertinent issue, the rationale for including the item, and relevant evidence from the literature, whenever possible. No systematic search was carried out to identify exemplars and evidence. We also include seven boxes at the end of the document that provide a more comprehensive explanation of certain thematic aspects of the methodology and conduct of systematic reviews. Although we focus on a minimal list of items to consider when reporting a systematic review, we indicate places where additional information is desirable to improve transparency of the review process. We present the items numerically from 1 to 27; however, authors need not address items in this particular order in their reports. Rather, what is important is that the information for each item is given somewhere within the report. Identify the report as a systematic review, meta-analysis, or both. Explanation Authors should identify their report as a systematic review or meta-analysis. Terms such as “review” or “overview” do not describe for readers whether the review was systematic or whether a meta-analysis was performed. A recent survey found that 50% of 300 authors did not mention the terms “systematic review” or “meta-analysis” in the title or abstract of their systematic review.3 Although sensitive search strategies have been developed to identify systematic reviews,22 inclusion of the terms systematic review or meta-analysis in the title may improve indexing and identification. We advise authors to use informative titles that make key information easily accessible to readers. Ideally, a title reflecting the PICOS approach (participants, interventions, comparators, outcomes, and study design) (see item 11 and box 2) may help readers as it provides key information about the scope of the review. Specifying the design(s) of the studies included, as shown in the examples, may also help some readers and those searching databases. Some journals recommend “indicative titles” that indicate the topic matter of the review, while others require declarative titles that give the review’s main conclusion. Busy practitioners may prefer to see the conclusion of the review in the title, but declarative titles can oversimplify or exaggerate findings. Thus, many journals and methodologists prefer indicative titles as used in the examples above. Provide a structured summary including, as applicable, background; objectives; data sources; study eligibility criteria, participants, and interventions; study appraisal and synthesis methods; results; limitations; conclusions and implications of key findings; funding for the systematic review; and systematic review registration number. Example “Context: The role and dose of oral vitamin D supplementation in nonvertebral fracture prevention have not been well established. Objective: To estimate the effectiveness of vitamin D supplementation in preventing hip and nonvertebral fractures in older persons. 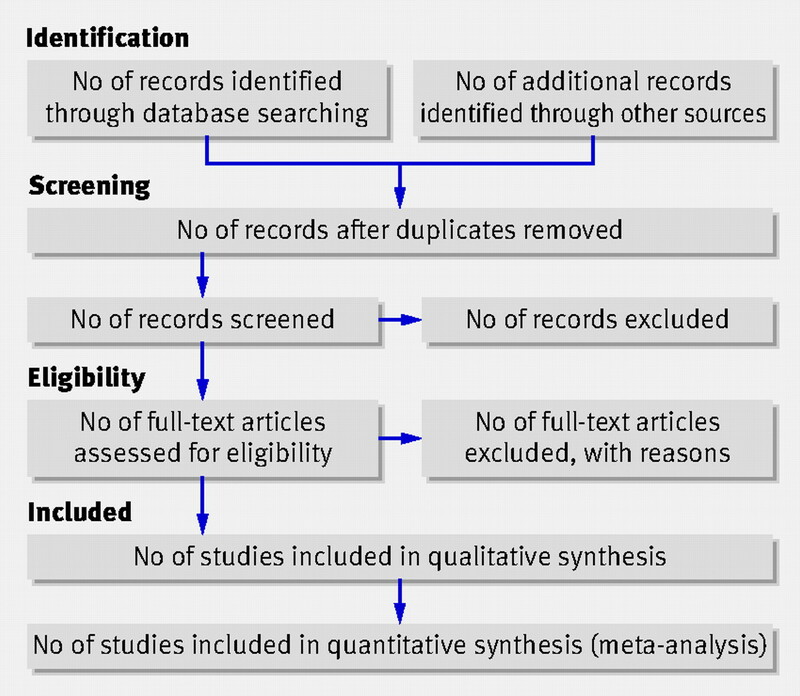 Data Sources: A systematic review of English and non-English articles using MEDLINE and the Cochrane Controlled Trials Register (1960-2005), and EMBASE (1991-2005). Additional studies were identified by contacting clinical experts and searching bibliographies and abstracts presented at the American Society for Bone and Mineral Research (1995-2004). Search terms included randomised controlled trial (RCT), controlled clinical trial, random allocation, double-blind method, cholecalciferol, ergocalciferol, 25-hydroxyvitamin D, fractures, humans, elderly, falls, and bone density. Study Selection: Only double-blind RCTs of oral vitamin D supplementation (cholecalciferol, ergocalciferol) with or without calcium supplementation vs calcium supplementation or placebo in older persons (>60 years) that examined hip or nonvertebral fractures were included. Data Extraction: Independent extraction of articles by 2 authors using predefined data fields, including study quality indicators. Data Synthesis: All pooled analyses were based on random-effects models. Five RCTs for hip fracture (n=9294) and 7 RCTs for nonvertebral fracture risk (n=9820) met our inclusion criteria. All trials used cholecalciferol. Heterogeneity among studies for both hip and nonvertebral fracture prevention was observed, which disappeared after pooling RCTs with low-dose (400 IU/d) and higher-dose vitamin D (700-800 IU/d), separately. A vitamin D dose of 700 to 800 IU/d reduced the relative risk (RR) of hip fracture by 26% (3 RCTs with 5572 persons; pooled RR, 0.74; 95% confidence interval [CI], 0.61-0.88) and any nonvertebral fracture by 23% (5 RCTs with 6098 persons; pooled RR, 0.77; 95% CI, 0.68-0.87) vs calcium or placebo. No significant benefit was observed for RCTs with 400 IU/d vitamin D (2 RCTs with 3722 persons; pooled RR for hip fracture, 1.15; 95% CI, 0.88-1.50; and pooled RR for any nonvertebral fracture, 1.03; 95% CI, 0.86-1.24). Explanation Abstracts provide key information that enables readers to understand the scope, processes, and findings of a review and to decide whether to read the full report. The abstract may be all that is readily available to a reader, for example, in a bibliographic database. The abstract should present a balanced and realistic assessment of the review’s findings that mirrors, albeit briefly, the main text of the report. A highly structured abstract of a systematic review could include the following headings: Context (or Background); Objective (or Purpose); Data sources; Study selection (or Eligibility criteria); Study appraisal and Synthesis methods (or Data extraction and Data synthesis); Results; Limitations; and Conclusions (or Implications). Alternatively, a simpler structure could cover but collapse some of the above headings (such as label Study selection and Study appraisal as Review methods) or omit some headings such as Background and Limitations. In the highly structured abstract mentioned above, authors use the Background heading to set the context for readers and explain the importance of the review question. Under the Objectives heading, they ideally use elements of PICOS (see box 2) to state the primary objective of the review. Under a Data sources heading, they summarise sources that were searched, any language or publication type restrictions, and the start and end dates of searches. Study selection statements then ideally describe who selected studies using what inclusion criteria. Data extraction methods statements describe appraisal methods during data abstraction and the methods used to integrate or summarise the data. The Data synthesis section is where the main results of the review are reported. If the review includes meta-analyses, authors should provide numerical results with confidence intervals for the most important outcomes. Ideally, they should specify the amount of evidence in these analyses (numbers of studies and numbers of participants). Under a Limitations heading, authors might describe the most important weaknesses of included studies as well as limitations of the review process. Then authors should provide clear and balanced Conclusions that are closely linked to the objective and findings of the review. Additionally, it would be helpful if authors included some information about funding for the review. Finally, although protocol registration for systematic reviews is still not common practice, if authors have registered their review or received a registration number, we recommend providing the registration information at the end of the abstract. Taking all the above considerations into account, the intrinsic tension between the goal of completeness of the abstract and its keeping into the space limit often set by journal editors is recognised as a major challenge. Describe the rationale for the review in the context of what is already known. Explanation Readers need to understand the rationale behind the study and what the systematic review may add to what is already known. Authors should tell readers whether their report is a new systematic review or an update of an existing one. If the review is an update, authors should state reasons for the update, including what has been added to the evidence base since the previous version of the review. An ideal background or introduction that sets context for readers might include the following. First, authors might define the importance of the review question from different perspectives (such as public health, individual patient, or health policy). Second, authors might briefly mention the current state of knowledge and its limitations. As in the above example, information about the effects of several different interventions may be available that helps readers understand why potential relative benefits or harms of particular interventions need review. Third, authors might whet readers’ appetites by clearly stating what the review aims to add. They also could discuss the extent to which the limitations of the existing evidence base may be overcome by the review. Provide an explicit statement of questions being addressed with reference to participants, interventions, comparisons, outcomes, and study design (PICOS). Explanation The questions being addressed, and the rationale for them, are one of the most critical parts of a systematic review. They should be stated precisely and explicitly so that readers can understand quickly the review’s scope and the potential applicability of the review to their interests.35 Framing questions so that they include the following five “PICOS” components may improve the explicitness of review questions: (1) the patient population or disease being addressed (P), (2) the interventions or exposure of interest (I), (3) the comparators (C), (4) the main outcome or endpoint of interest (O), and (5) the study designs chosen (S). For more detail regarding PICOS, see box 2. Good review questions may be narrowly focused or broad, depending on the overall objectives of the review. Sometimes broad questions might increase the applicability of the results and facilitate detection of bias, exploratory analyses, and sensitivity analyses.35 36 Whether narrowly focused or broad, precisely stated review objectives are critical as they help define other components of the review process such as the eligibility criteria (item 6) and the search for relevant literature (items 7 and 8). Indicate if a review protocol exists, if and where it can be accessed (such as a web address), and, if available, provide registration information including the registration number. Authors may modify protocols during the research, and readers should not automatically consider such modifications inappropriate. For example, legitimate modifications may extend the period of searches to include older or newer studies, broaden eligibility criteria that proved too narrow, or add analyses if the primary analyses suggest that additional ones are warranted. Authors should, however, describe the modifications and explain their rationale. Although worthwhile protocol amendments are common, one must consider the effects that protocol modifications may have on the results of a systematic review, especially if the primary outcome is changed. Bias from selective outcome reporting in randomised trials has been well documented.42 43 An examination of 47 Cochrane reviews revealed indirect evidence for possible selective reporting bias for systematic reviews. Almost all (n=43) contained a major change, such as the addition or deletion of outcomes, between the protocol and the full publication.44 Whether (or to what extent) the changes reflected bias, however, was not clear. For example, it has been rather common not to describe outcomes that were not presented in any of the included studies. Specify study characteristics (such as PICOS, length of follow-up) and report characteristics (such as years considered, language, publication status) used as criteria for eligibility, giving rationale. Explanation Knowledge of the eligibility criteria is essential in appraising the validity, applicability, and comprehensiveness of a review. Thus, authors should unambiguously specify eligibility criteria used in the review. Carefully defined eligibility criteria inform various steps of the review methodology. They influence the development of the search strategy and serve to ensure that studies are selected in a systematic and unbiased manner. Describe all information sources in the search (such as databases with dates of coverage, contact with study authors to identify additional studies) and date last searched. Explanation The National Library of Medicine’s Medline database is one of the most comprehensive sources of healthcare information in the world. Like any database, however, its coverage is not complete and varies according to the field. Retrieval from any single database, even by an experienced searcher, may be imperfect, which is why detailed reporting is important within the systematic review. In addition to searching databases, authors should report the use of supplementary approaches to identify studies, such as hand searching of journals, checking reference lists, searching trials registries or regulatory agency websites,67 contacting manufacturers, or contacting authors. Authors should also report if they attempted to acquire any missing information (such as on study methods or results) from investigators or sponsors; it is useful to describe briefly who was contacted and what unpublished information was obtained. Present the full electronic search strategy for at least one major database, including any limits used, such that it could be repeated. 24. ((singl$ or doubl$ or trebl$ or tripl$) adj (blind$)).ti,ab. 34. (control$ or prospective$ or volunteer$).ti,ab. We realise that journal restrictions vary and that having the search strategy in the text of the report is not always feasible. We strongly encourage all journals, however, to find ways—such as a “web extra,” appendix, or electronic link to an archive—to make search strategies accessible to readers. We also advise all authors to archive their searches so that (1) others may access and review them (such as replicate them or understand why their review of a similar topic did not identify the same reports), and (2) future updates of their review are facilitated. State the process for selecting studies (that is, for screening, for determining eligibility, for inclusion in the systematic review, and, if applicable, for inclusion in the meta-analysis). Explanation There is no standard process for selecting studies to include in a systematic review. Authors usually start with a large number of identified records from their search and sequentially exclude records according to eligibility criteria. We advise authors to report how they screened the retrieved records (typically a title and abstract), how often it was necessary to review the full text publication, and if any types of record (such as letters to the editor) were excluded. We also advise using the PRISMA flow diagram to summarise study selection processes (see item 17 and box 3). Efforts to enhance objectivity and avoid mistakes in study selection are important. Thus authors should report whether each stage was carried out by one or several people, who these people were, and, whenever multiple independent investigators performed the selection, what the process was for resolving disagreements. The use of at least two investigators may reduce the possibility of rejecting relevant reports.75 The benefit may be greatest for topics where selection or rejection of an article requires difficult judgments.76 For these topics, authors should ideally tell readers the level of inter-rater agreement, how commonly arbitration about selection was required, and what efforts were made to resolve disagreements (such as by contact with the authors of the original studies). Describe the method of data extraction from reports (such as piloted forms, independently by two reviewers) and any processes for obtaining and confirming data from investigators. Some systematic reviewers use a data extraction form that could be reported as an appendix or “Web extra” to their report. These forms could show the reader what information reviewers sought (see item 11) and how they extracted it. Authors could tell readers if the form was piloted. Regardless, we advise authors to tell readers who extracted what data, whether any extractions were completed in duplicate, and, if so, whether duplicate abstraction was done independently and how disagreements were resolved. Some studies are published more than once. Duplicate publications may be difficult to ascertain, and their inclusion may introduce bias.80 81 We advise authors to describe any steps they used to avoid double counting and piece together data from multiple reports of the same study (such as juxtaposing author names, treatment comparisons, sample sizes, or outcomes). We also advise authors to indicate whether all reports on a study were considered, as inconsistencies may reveal important limitations. For example, a review of multiple publications of drug trials showed that reported study characteristics may differ from report to report, including the description of the design, number of patients analysed, chosen significance level, and outcomes.82 Authors ideally should present any algorithm that they used to select data from overlapping reports and any efforts they used to solve logical inconsistencies across reports. List and define all variables for which data were sought (such as PICOS, funding sources) and any assumptions and simplifications made. Explanation It is important for readers to know what information review authors sought, even if some of this information was not available.84 If the review is limited to reporting only those variables that were obtained, rather than those that were deemed important but could not be obtained, bias might be introduced and the reader might be misled. It is therefore helpful if authors can refer readers to the protocol (see item 5) and archive their extraction forms (see item 10), including definitions of variables. The published systematic review should include a description of the processes used with, if relevant, specification of how readers can get access to additional materials. We encourage authors to report whether some variables were added after the review started. Such variables might include those found in the studies that the reviewers identified (such as important outcome measures that the reviewers initially overlooked). Authors should describe the reasons for adding any variables to those already pre-specified in the protocol so that readers can understand the review process. We advise authors to report any assumptions they made about missing or unclear information and to explain those processes. For example, in studies of women aged 50 or older it is reasonable to assume that none were pregnant, even if this is not reported. Likewise, review authors might make assumptions about the route of administration of drugs assessed. However, special care should be taken in making assumptions about qualitative information. For example, the upper age limit for “children” can vary from 15 years to 21 years, “intense” physiotherapy might mean very different things to different researchers at different times and for different patients, and the volume of blood associated with “heavy” blood loss might vary widely depending on the setting. Describe methods used for assessing risk of bias in individual studies (including specification of whether this was done at the study or outcome level, or both), and how this information is to be used in any data synthesis. Many methods exist to assess the overall risk of bias in included studies, including scales, checklists, and individual components.90 91 As discussed in box 4, scales that numerically summarise multiple components into a single number are misleading and unhelpful.92 93 Rather, authors should specify the methodological components that they assessed. Common markers of validity for randomised trials include the following: appropriate generation of random allocation sequence;94 concealment of the allocation sequence;93 blinding of participants, health care providers, data collectors, and outcome adjudicators;95 96 97 98 proportion of patients lost to follow-up;99 100 stopping of trials early for benefit;101 and whether the analysis followed the intention-to-treat principle.100 102 The ultimate decision regarding which methodological features to evaluate requires consideration of the strength of the empiric data, theoretical rationale, and the unique circumstances of the included studies. Authors should report how they assessed risk of bias; whether it was in a blind manner; and if assessments were completed by more than one person, and if so, whether they were completed independently.103 104 Similarly, we encourage authors to report any calibration exercises among review team members that were done. Finally, authors need to report how their assessments of risk of bias are used subsequently in the data synthesis (see item 16). Despite the often difficult task of assessing the risk of bias in included studies, authors are sometimes silent on what they did with the resultant assessments.89 If authors exclude studies from the review or any subsequent analyses on the basis of the risk of bias, they should tell readers which studies they excluded and explain the reasons for those exclusions (see item 6). Authors should also describe any planned sensitivity or subgroup analyses related to bias assessments (see item 16). State the principal summary measures (such as risk ratio, difference in means). Explanation When planning a systematic review, it is generally desirable that authors pre-specify the outcomes of primary interest (see item 5) as well as the intended summary effect measure for each outcome. The chosen summary effect measure may differ from that used in some of the included studies. If possible the choice of effect measures should be explained, though it is not always easy to judge in advance which measure is the most appropriate. For binary outcomes, the most common summary measures are the risk ratio, odds ratio, and risk difference.108 Relative effects are more consistent across studies than absolute effects,109 110 although absolute differences are important when interpreting findings (see item 24). For continuous outcomes, the natural effect measure is the difference in means.108 Its use is appropriate when outcome measurements in all studies are made on the same scale. The standardised difference in means is used when the studies do not yield directly comparable data. Usually this occurs when all studies assess the same outcome but measure it in a variety of ways (such as different scales to measure depression). For time-to-event outcomes, the hazard ratio is the most common summary measure. Reviewers need the log hazard ratio and its standard error for a study to be included in a meta-analysis.111 This information may not be given for all studies, but methods are available for estimating the desired quantities from other reported information.111 Risk ratio and odds ratio (in relation to events occurring by a fixed time) are not equivalent to the hazard ratio, and median survival times are not a reliable basis for meta-analysis.112 If authors have used these measures they should describe their methods in the report. Describe the methods of handling data and combining results of studies, if done, including measures of consistency (such as I2) for each meta-analysis. Explanation The data extracted from the studies in the review may need some transformation (processing) before they are suitable for analysis or for presentation in an evidence table. Although such data handling may facilitate meta-analyses, it is sometimes needed even when meta-analyses are not done. For example, in trials with more than two intervention groups it may be necessary to combine results for two or more groups (such as receiving similar but non-identical interventions), or it may be desirable to include only a subset of the data to match the review’s inclusion criteria. When several different scales (such as for depression) are used across studies, the sign of some scores may need to be reversed to ensure that all scales are aligned (such as so low values represent good health on all scales). Standard deviations may have to be reconstructed from other statistics such as P values and t statistics,115 116 or occasionally they may be imputed from the standard deviations observed in other studies.117 Time-to-event data also usually need careful conversions to a consistent format.111 Authors should report details of any such data processing. Statistical combination of data from two or more separate studies in a meta-analysis may be neither necessary nor desirable (see box 5 and item 21). Regardless of the decision to combine individual study results, authors should report how they planned to evaluate between-study variability (heterogeneity or inconsistency) (box 6). The consistency of results across trials may influence the decision of whether to combine trial results in a meta-analysis. When meta-analysis is done, authors should specify the effect measure (such as relative risk or mean difference) (see item 13), the statistical method (such as inverse variance), and whether a fixed-effects or random-effects approach, or some other method (such as Bayesian) was used (see box 6). If possible, authors should explain the reasons for those choices. Specify any assessment of risk of bias that may affect the cumulative evidence (such as publication bias, selective reporting within studies). Explanation Reviewers should explore the possibility that the available data are biased. They may examine results from the available studies for clues that suggest there may be missing studies (publication bias) or missing data from the included studies (selective reporting bias) (see box 7). Authors should report in detail any methods used to investigate possible bias across studies. Describe methods of additional analyses (such as sensitivity or subgroup analyses, meta-regression), if done, indicating which were pre-specified. Even with limited data, many additional analyses can be undertaken. The choice of which analysis to undertake will depend on the aims of the review. None of these analyses, however, is exempt from producing potentially misleading results. It is important to inform readers whether these analyses were performed, their rationale, and which were pre-specified. Give numbers of studies screened, assessed for eligibility, and included in the review, with reasons for exclusions at each stage, ideally with a flow diagram. See flow diagram in fig 2⇓. The flow diagram and text should describe clearly the process of report selection throughout the review. Authors should report unique records identified in searches, records excluded after preliminary screening (such as screening of titles and abstracts), reports retrieved for detailed evaluation, potentially eligible reports that were not retrievable, retrieved reports that did not meet inclusion criteria and the primary reasons for exclusion, and the studies included in the review. Indeed, the most appropriate layout may vary for different reviews. Authors should also note the presence of duplicate or supplementary reports so that readers understand the number of individual studies compared with the number of reports that were included in the review. Authors should be consistent in their use of terms, such as whether they are reporting on counts of citations, records, publications, or studies. We believe that reporting the number of studies is the most important. For each study, present characteristics for which data were extracted (such as study size, PICOS, follow-up period) and provide the citation. All four studies finally selected for the review were randomised controlled trials published in English. The duration of the intervention was 24 months for the RIO-North America and 12 months for the RIO-Diabetes, RIO-Lipids and RIO-Europe study. Although the last two described a period of 24 months during which they were conducted, only the first 12-months results are provided. All trials had a run-in, as a single blind period before the randomisation. The included studies involved 6625 participants. The main inclusion criteria entailed adults (18 years or older), with a body mass index greater than 27 kg/m2 and less than 5 kg variation in body weight within the three months before study entry. All trials were multicentric. The RIO-North America was conducted in the USA and Canada, RIO-Europe in Europe and the USA, RIO-Diabetes in the USA and 10 other different countries not specified, and RIO-Lipids in eight unspecified different countries. The intervention received was placebo, 5 mg of rimonabant or 20 mg of rimonabant once daily in addition to a mild hypocaloric diet (600 kcal/day deficit). In all studies the primary outcome assessed was weight change from baseline after one year of treatment and the RIO-North America study also evaluated the prevention of weight regain between the first and second year. All studies evaluated adverse effects, including those of any kind and serious events. Quality of life was measured in only one study, but the results were not described (RIO-Europe). These included prevalence of metabolic syndrome after one year and change in cardiometabolic risk factors such as blood pressure, lipid profile, etc. No study included mortality and costs as outcome. In table: See table 2⇓. Explanation For readers to gauge the validity and applicability of a systematic review’s results, they need to know something about the included studies. Such information includes PICOS (box 2) and specific information relevant to the review question. For example, if the review is examining the long term effects of antidepressants for moderate depressive disorder, authors should report the follow-up periods of the included studies. For each included study, authors should provide a citation for the source of their information regardless of whether or not the study is published. This information makes it easier for interested readers to retrieve the relevant publications or documents. Reporting study-level data also allows the comparison of the main characteristics of the studies included in the review. Authors should present enough detail to allow readers to make their own judgments about the relevance of included studies. Such information also makes it possible for readers to conduct their own subgroup analyses and interpret subgroups, based on study characteristics. Authors should avoid, whenever possible, assuming information when it is missing from a study report (such as sample size, method of randomisation). Reviewers may contact the original investigators to try to obtain missing information or confirm the data extracted for the systematic review. If this information is not obtained, this should be noted in the report. If information is imputed, the reader should be told how this was done and for which items. Presenting study-level data makes it possible to clearly identify unpublished information obtained from the original researchers and make it available for the public record. Typically, study-level characteristics are presented as a table as in the example (table 2⇑). Such presentation ensures that all pertinent items are addressed and that missing or unclear information is clearly indicated. Although paper based journals do not generally allow for the quantity of information available in electronic journals or Cochrane reviews, this should not be accepted as an excuse for omission of important aspects of the methods or results of included studies, since these can, if necessary, be shown on a website. Following the presentation and description of each included study, as discussed above, reviewers usually provide a narrative summary of the studies. Such a summary provides readers with an overview of the included studies. It may, for example, address the languages of the published papers, years of publication, and geographic origins of the included studies. Present data on risk of bias of each study and, if available, any outcome-level assessment (see item 12). Reporting only summary data (such as “two of eight trials adequately concealed allocation”) is inadequate because it fails to inform readers which studies had the particular methodological shortcoming. A more informative approach is to explicitly report the methodological features evaluated for each study. The Cochrane Collaboration’s new tool for assessing the risk of bias also requests that authors substantiate these assessments with any relevant text from the original studies.11 It is often easiest to provide these data in a tabular format, as in the example. However, a narrative summary describing the tabular data can also be helpful for readers. For all outcomes considered (benefits and harms), present, for each study, simple summary data for each intervention group and effect estimates and confidence intervals, ideally with a forest plot. Examples See table 4⇓ and fig 3⇓. For each study, the summary data for each intervention group are generally given for binary outcomes as frequencies with and without the event (or as proportions such as 12/45). It is not sufficient to report event rates per intervention group as percentages. The required summary data for continuous outcomes are the mean, standard deviation, and sample size for each group. In reviews that examine time-to-event data, the authors should report the log hazard ratio and its standard error (or confidence interval) for each included study. Sometimes, essential data are missing from the reports of the included studies and cannot be calculated from other data but may need to be imputed by the reviewers. For example, the standard deviation may be imputed using the typical standard deviations in the other trials116 117 (see item 14). Whenever relevant, authors should indicate which results were not reported directly and had to be estimated from other information (see item 13). In addition, the inclusion of unpublished data should be noted. For all included studies it is important to present the estimated effect with a confidence interval. This information may be incorporated in a table showing study characteristics or may be shown in a forest plot.140 The key elements of the forest plot are the effect estimates and confidence intervals for each study shown graphically, but it is preferable also to include, for each study, the numerical group-specific summary data, the effect size and confidence interval, and the percentage weight (see second example, fig 3⇑). For discussion of the results of meta-analysis, see item 21. In principle, all the above information should be provided for every outcome considered in the review, including both benefits and harms. When there are too many outcomes for full information to be included, results for the most important outcomes should be included in the main report with other information provided as a web appendix. The choice of the information to present should be justified in light of what was originally stated in the protocol. Authors should explicitly mention if the planned main outcomes cannot be presented due to lack of information. There is some evidence that information on harms is only rarely reported in systematic reviews, even when it is available in the original studies.141 Selective omission of harms results biases a systematic review and decreases its ability to contribute to informed decision making. Present the main results of the review. If meta-analyses are done, include for each, confidence intervals and measures of consistency. Explanation Results of systematic reviews should be presented in an orderly manner. Initial narrative descriptions of the evidence covered in the review (see item 18) may tell readers important things about the study populations and the design and conduct of studies. These descriptions can facilitate the examination of patterns across studies. They may also provide important information about applicability of evidence, suggest the likely effects of any major biases, and allow consideration, in a systematic manner, of multiple explanations for possible differences of findings across studies. If authors have conducted one or more meta-analyses, they should present the results as an estimated effect across studies with a confidence interval. It is often simplest to show each meta-analysis summary with the actual results of included studies in a forest plot (see item 20).140 It should always be clear which of the included studies contributed to each meta-analysis. Authors should also provide, for each meta-analysis, a measure of the consistency of the results from the included studies such as I2 (heterogeneity, see box 6); a confidence interval may also be given for this measure.145 If no meta-analysis was performed, the qualitative inferences should be presented as systematically as possible with an explanation of why meta-analysis was not done, as in the second example above.143 Readers may find a forest plot, without a summary estimate, helpful in such cases. Authors should in general report syntheses for all the outcome measures they set out to investigate (that is, those described in the protocol, see item 4) to allow readers to draw their own conclusions about the implications of the results. Readers should be made aware of any deviations from the planned analysis. Authors should tell readers if the planned meta-analysis was not thought appropriate or possible for some of the outcomes and the reasons for that decision. It may not always be sensible to give meta-analysis results and forest plots for each outcome. If the review addresses a broad question, there may be a very large number of outcomes. Also, some outcomes may have been reported in only one or two studies, in which case forest plots are of little value and may be seriously biased. Of 300 systematic reviews indexed in Medline in 2004, a little more than half (54%) included meta-analyses, of which the majority (91%) reported assessing for inconsistency in results. Present results of any assessment of risk of bias across studies (see item 15). Explanation Authors should present the results of any assessments of risk of bias across studies. If a funnel plot is reported, authors should specify the effect estimate and measure of precision used, presented typically on the x axis and y axis, respectively. Authors should describe if and how they have tested the statistical significance of any possible asymmetry (see item 15). Results of any investigations of selective reporting of outcomes within studies (as discussed in item 15) should also be reported. Also, we advise authors to tell readers if any pre-specified analyses for assessing risk of bias across studies were not completed and the reasons (such as too few included studies). Give results of additional analyses, if done (such as sensitivity or subgroup analyses, meta-regression [see item 16]). Explanation Authors should report any subgroup or sensitivity analyses and whether they were pre-specified (see items 5 and 16). For analyses comparing subgroups of studies (such as separating studies of low and high dose aspirin), the authors should report any tests for interactions, as well as estimates and confidence intervals from meta-analyses within each subgroup. Similarly, meta-regression results (see item 16) should not be limited to P values but should include effect sizes and confidence intervals,150 as the first example reported above does in a table. The amount of data included in each additional analysis should be specified if different from that considered in the main analyses. This information is especially relevant for sensitivity analyses that exclude some studies; for example, those with high risk of bias. Importantly, all additional analyses conducted should be reported, not just those that were statistically significant. This information will help avoid selective outcome reporting bias within the review as has been demonstrated in reports of randomised controlled trials.42 44 121 151 152 Results from exploratory subgroup or sensitivity analyses should be interpreted cautiously, bearing in mind the potential for multiple analyses to mislead. Summarise the main findings, including the strength of evidence for each main outcome; consider their relevance to key groups (such as healthcare providers, users, and policy makers). Example “Overall, the evidence is not sufficiently robust to determine the comparative effectiveness of angioplasty (with or without stenting) and medical treatment alone. Only 2 randomized trials with long-term outcomes and a third randomized trial that allowed substantial crossover of treatment after 3 months directly compared angioplasty and medical treatment…the randomized trials did not evaluate enough patients or did not follow patients for a sufficient duration to allow definitive conclusions to be made about clinical outcomes, such as mortality and cardiovascular or kidney failure events. Authors need to keep in mind that statistical significance of the effects does not always suggest clinical or policy relevance. Likewise, a non-significant result does not demonstrate that a treatment is ineffective. Authors should ideally clarify trade-offs and how the values attached to the main outcomes would lead different people to make different decisions. In addition, adroit authors consider factors that are important in translating the evidence to different settings and that may modify the estimates of effects reported in the review.153 Patients and healthcare providers may be primarily interested in which intervention is most likely to provide a benefit with acceptable harms, while policy makers and administrators may value data on organisational impact and resource utilisation. Discuss limitations at study and outcome level (such as risk of bias), and at review level (such as incomplete retrieval of identified research, reporting bias). Study and review level: “Our study has several limitations. The quality of the studies varied. Randomization was adequate in all trials; however, 7 of the articles did not explicitly state that analysis of data adhered to the intention-to-treat principle, which could lead to overestimation of treatment effect in these trials, and we could not assess the quality of 4 of the 5 trials reported as abstracts. Analyses did not identify an association between components of quality and re-bleeding risk, and the effect size in favour of combination therapy remained statistically significant when we excluded trials that were reported as abstracts. Explanation A discussion of limitations should address the validity (that is, risk of bias) and reporting (informativeness) of the included studies, limitations of the review process, and generalisability (applicability) of the review. Readers may find it helpful if authors discuss whether studies were threatened by serious risks of bias, whether the estimates of the effect of the intervention are too imprecise, or if there were missing data for many participants or important outcomes. Limitations of the review process might include limitations of the search (such as restricting to English-language publications), and any difficulties in the study selection, appraisal, and meta-analysis processes. For example, poor or incomplete reporting of study designs, patient populations, and interventions may hamper interpretation and synthesis of the included studies.84 Applicability of the review may be affected if there are limited data for certain populations or subgroups where the intervention might perform differently or few studies assessing the most important outcomes of interest; or if there is a substantial amount of data relating to an outdated intervention or comparator or heavy reliance on imputation of missing values for summary estimates (item 14). Provide a general interpretation of the results in the context of other evidence, and implications for future research. Explanation Systematic reviewers sometimes draw conclusions that are too optimistic157 or do not consider the harms equally as carefully as the benefits, although some evidence suggests these problems are decreasing.158 If conclusions cannot be drawn because there are too few reliable studies, or too much uncertainty, this should be stated. Such a finding can be as important as finding consistent effects from several large studies. Authors should try to relate the results of the review to other evidence, as this helps readers to better interpret the results. For example, there may be other systematic reviews about the same general topic that have used different methods or have addressed related but slightly different questions.159 160 Similarly, there may be additional information relevant to decision makers, such as the cost-effectiveness of the intervention (such as health technology assessment). Authors may discuss the results of their review in the context of existing evidence regarding other interventions. We advise authors also to make explicit recommendations for future research. In a sample of 2535 Cochrane reviews, 82% included recommendations for research with specific interventions, 30% suggested the appropriate type of participants, and 52% suggested outcome measures for future research.161 There is no corresponding assessment about systematic reviews published in medical journals, but we believe that such recommendations are much less common in those reviews. Clinical research should not be planned without a thorough knowledge of similar, existing research.162 There is evidence that this still does not occur as it should and that authors of primary studies do not consider a systematic review when they design their studies.163 We believe systematic reviews have great potential for guiding future clinical research. Describe sources of funding or other support (such as supply of data) for the systematic review, and the role of funders for the systematic review. The PRISMA statement and this document have focused on systematic reviews of reports of randomised trials. Other study designs, including non-randomised studies, quasi-experimental studies, and interrupted time series, are included in some systematic reviews that evaluate the effects of healthcare interventions.172 173 The methods of these reviews may differ to varying degrees from the typical intervention review, for example regarding the literature search, data abstraction, assessment of risk of bias, and analysis methods. As such, their reporting demands might also differ from what we have described here. A useful principle is for systematic review authors to ensure that their methods are reported with adequate clarity and transparency to enable readers to critically judge the available evidence and replicate or update the research. In some systematic reviews, the authors will seek the raw data from the original researchers to calculate the summary statistics. These systematic reviews are called individual patient (or participant) data reviews.40 41 Individual patient data meta-analyses may also be conducted with prospective accumulation of data rather than retrospective accumulation of existing data. Here too, extra information about the methods will need to be reported. Other types of systematic reviews exist. Realist reviews aim to determine how complex programmes work in specific contexts and settings.174 Meta-narrative reviews aim to explain complex bodies of evidence through mapping and comparing different overarching storylines.175 Network meta-analyses, also known as multiple treatments meta-analyses, can be used to analyse data from comparisons of many different treatments.176 177 They use both direct and indirect comparisons and can be used to compare interventions that have not been directly compared. We believe that the issues we have highlighted in this paper are relevant to ensure transparency and understanding of the processes adopted and the limitations of the information presented in systematic reviews of different types. We hope that PRISMA can be the basis for more detailed guidance on systematic reviews of other types of research, including diagnostic accuracy and epidemiological studies. We developed the PRISMA statement using an approach for developing reporting guidelines that has evolved over several years.178 The overall aim of PRISMA is to help ensure the clarity and transparency of reporting of systematic reviews, and recent data indicate that this reporting guidance is much needed.3 PRISMA is not intended to be a quality assessment tool and it should not be used as such. This PRISMA explanation and elaboration document was developed to facilitate the understanding, uptake, and dissemination of the PRISMA statement and hopefully provide a pedagogical framework for those interested in conducting and reporting systematic reviews. It follows a format similar to that used in other explanatory documents.17 18 19 Following the recommendations in the PRISMA checklist may increase the word count of a systematic review report. We believe, however, that the benefit of readers being able to critically appraise a clear, complete, and transparent systematic review report outweighs the possible slight increase in the length of the report. While the aims of PRISMA are to reduce the risk of flawed reporting of systematic reviews and improve the clarity and transparency in how reviews are conducted, we have little data to state more definitively whether this “intervention” will achieve its intended goal. A previous effort to evaluate QUOROM was not successfully completed.178 Publication of the QUOROM statement was delayed for two years while a research team attempted to evaluate its effectiveness by conducting a randomised controlled trial with the participation of eight major medical journals. Unfortunately that trial was not completed due to accrual problems (David Moher, personal communication). Other evaluation methods might be easier to conduct. At least one survey of 139 published systematic reviews in the critical care literature179 suggests that their quality improved after the publication of QUOROM. If the PRISMA statement is endorsed by and adhered to in journals, as other reporting guidelines have been,17 18 19 180 there should be evidence of improved reporting of systematic reviews. For example, there have been several evaluations of whether the use of CONSORT improves reports of randomised controlled trials. A systematic review of these studies181 indicates that use of CONSORT is associated with improved reporting of certain items, such as allocation concealment. We aim to evaluate the benefits (that is, improved reporting) and possible adverse effects (such as increased word length) of PRISMA and we encourage others to consider doing likewise. Even though we did not carry out a systematic literature search to produce our checklist, and this is indeed a limitation of our effort, PRISMA was developed using an evidence based approach whenever possible. Checklist items were included if there was evidence that not reporting the item was associated with increased risk of bias, or where it was clear that information was necessary to appraise the reliability of a review. To keep PRISMA up to date and as evidence based as possible requires regular vigilance of the literature, which is growing rapidly. Currently the Cochrane Methodology Register has more than 11 000 records pertaining to the conduct and reporting of systematic reviews and other evaluations of health and social care. For some checklist items, such as reporting the abstract (item 2), we have used evidence from elsewhere in the belief that the issue applies equally well to reporting of systematic reviews. Yet for other items, evidence does not exist; for example, whether a training exercise improves the accuracy and reliability of data extraction. We hope PRISMA will act as a catalyst to help generate further evidence that can be considered when further revising the checklist in the future. More than 10 years have passed between the development of the QUOROM statement and its update, the PRISMA statement. We aim to update PRISMA more frequently. We hope that the implementation of PRISMA will be better than it has been for QUOROM. There are at least two reasons to be optimistic. First, systematic reviews are increasingly used by healthcare providers to inform “best practice” patient care. Policy analysts and managers are using systematic reviews to inform healthcare decision making and to better target future research. Second, we anticipate benefits from the development of the EQUATOR Network, described below. Developing any reporting guideline requires considerable effort, experience, and expertise. While reporting guidelines have been successful for some individual efforts,17 18 19 there are likely others who want to develop reporting guidelines who possess little time, experience, or knowledge as to how to do so appropriately. The EQUATOR (enhancing the quality and transparency of health research) Network aims to help such individuals and groups by serving as a global resource for anybody interested in developing reporting guidelines, regardless of the focus.7 180 182 The overall goal of EQUATOR is to improve the quality of reporting of all health science research through the development and translation of reporting guidelines. Beyond this aim, the network plans to develop a large web presence by developing and maintaining a resource centre of reporting tools, and other information for reporting research (www.equator-network.org/). We encourage healthcare journals and editorial groups, such as the World Association of Medical Editors and the International Committee of Medical Journal Editors, to endorse PRISMA in much the same way as they have endorsed other reporting guidelines, such as CONSORT. We also encourage editors of healthcare journals to support PRISMA by updating their “instructions to authors” and including the PRISMA web address, and by raising awareness through specific editorial actions. The terminology used to describe systematic reviews and meta-analyses has evolved over time and varies between fields. Different terms have been used by different groups, such as educators and psychologists. The conduct of a systematic review comprises several explicit and reproducible steps, such as identifying all likely relevant records, selecting eligible studies, assessing the risk of bias, extracting data, qualitative synthesis of the included studies, and possibly meta-analyses. Systematic review A systematic review attempts to collate all empirical evidence that fits pre-specified eligibility criteria to answer a specific research question. It uses explicit, systematic methods that are selected with a view to minimising bias, thus providing reliable findings from which conclusions can be drawn and decisions made.184 185 The key characteristics of a systematic review are (a) a clearly stated set of objectives with an explicit, reproducible methodology; (b) a systematic search that attempts to identify all studies that would meet the eligibility criteria; (c) an assessment of the validity of the findings of the included studies, such as through the assessment of risk of bias; and (d) systematic presentation and synthesis of the characteristics and findings of the included studies. Meta-analysis Meta-analysis is the use of statistical techniques to integrate and summarise the results of included studies. Many systematic reviews contain meta-analyses, but not all. By combining information from all relevant studies, meta-analyses can provide more precise estimates of the effects of health care than those derived from the individual studies included within a review. Formulating relevant and precise questions that can be answered in a systematic review can be complex and time consuming. A structured approach for framing questions that uses five components may help facilitate the process. This approach is commonly known by the acronym “PICOS” where each letter refers to a component: the patient population or the disease being addressed (P), the interventions or exposure (I), the comparator group (C), the outcome or endpoint (O), and the study design chosen (S).186 Issues relating to PICOS affect several PRISMA items (items 6, 8, 9, 10, 11, and 18). P—Providing information about the population requires a precise definition of a group of participants (often patients), such as men over the age of 65 years, their defining characteristics of interest (often disease), and possibly the setting of care considered, such as an acute care hospital. I—The interventions (exposures) under consideration in the systematic review need to be transparently reported. For example, if the reviewers answer a question regarding the association between a woman’s prenatal exposure to folic acid and subsequent offspring’s neural tube defects, reporting the dose, frequency, and duration of folic acid used in different studies is likely to be important for readers to interpret the review’s results and conclusions. Other interventions (exposures) might include diagnostic, preventive, or therapeutic treatments; arrangements of specific processes of care; lifestyle changes; psychosocial or educational interventions; or risk factors. C—Clearly reporting the comparator (control) group intervention(s)—such as usual care, drug, or placebo—is essential for readers to fully understand the selection criteria of primary studies included in the systematic review, and might be a source of heterogeneity investigators have to deal with. Comparators are often poorly described. Clearly reporting what the intervention is compared with is important and may sometimes have implications for the inclusion of studies in a review—many reviews compare with “standard care,” which is otherwise undefined; this should be properly addressed by authors. O—The outcomes of the intervention being assessed—such as mortality, morbidity, symptoms, or quality of life improvements—should be clearly specified as they are required to interpret the validity and generalisability of the systematic review’s results. S—Finally, the type of study design(s) included in the review should be reported. Some reviews include only reports of randomised trials, whereas others have broader design criteria and include randomised trials and certain types of observational studies. Still other reviews, such as those specifically answering questions related to harms, may include a wide variety of designs ranging from cohort studies to case reports. Whatever study designs are included in the review, these should be reported. Comprehensive searches usually result in a large number of identified records, a much smaller number of studies included in the systematic review, and even fewer of these studies included in any meta-analyses. Reports of systematic reviews often provide little detail as to the methods used by the review team in this process. Readers are often left with what can be described as the “X-files” phenomenon, as it is unclear what occurs between the initial set of identified records and those finally included in the review. Sometimes, review authors simply report the number of included studies; more often they report the initial number of identified records and the number of included studies. Rarely, although this is optimal for readers, do review authors report the number of identified records, the smaller number of potentially relevant studies, and the even smaller number of included studies, by outcome. Review authors also need to differentiate between the number of reports and studies. Often there will not be a 1:1 ratio of reports to studies and this information needs to be described in the systematic review report. Ideally, the identification of study reports should be reported as text in combination with use of the PRISMA flow diagram. While we recommend use of the flow diagram, a small number of reviews might be particularly simple and can be sufficiently described with a few brief sentences of text. More generally, review authors will need to report the process used for each step: screening the identified records; examining the full text of potentially relevant studies (and reporting the number that could not be obtained); and applying eligibility criteria to select the included studies. Similarly, some detail should be reported on who participated and how such processes were completed. For example, a single person may screen the identified records while a second person independently examines a small sample of them. The entire winnowing process is one of “good bookkeeping” whereby interested readers should be able to work backwards from the included studies to come up with the same numbers of identified records. There is often a paucity of information describing the data extraction processes in reports of systematic reviews. Authors may simply report that “relevant” data were extracted from each included study with little information about the processes used for data extraction. It may be useful for readers to know whether a systematic review’s authors developed, a priori or not, a data extraction form, whether multiple forms were used, the number of questions, whether the form was pilot tested, and who completed the extraction. For example, it is important for readers to know whether one or more people extracted data, and if so, whether this was completed independently, whether “consensus” data were used in the analyses, and if the review team completed an informal training exercise or a more formal reliability exercise. In this paper, and elsewhere,11 we sought to use a new term for many readers, namely, risk of bias, for evaluating each included study in a systematic review. Previous papers89 188 tended to use the term “quality.” When carrying out a systematic review we believe it is important to distinguish between quality and risk of bias and to focus on evaluating and reporting the latter. Quality is often the best the authors have been able to do. For example, authors may report the results of surgical trials in which blinding of the outcome assessors was not part of the trial’s conduct. Even though this may have been the best methodology the researchers were able to do, there are still theoretical grounds for believing that the study was susceptible to (risk of) bias. Assessing the risk of bias should be part of the conduct and reporting of any systematic review. In all situations, we encourage systematic reviewers to think ahead carefully about what risks of bias (methodological and clinical) may have a bearing on the results of their systematic reviews. For systematic reviewers, understanding the risk of bias on the results of studies is often difficult, because the report is only a surrogate of the actual conduct of the study. There is some suggestion189 190 that the report may not be a reasonable facsimile of the study, although this view is not shared by all.88 191 There are three main ways to assess risk of bias—individual components, checklists, and scales. There are a great many scales available,192 although we caution against their use based on theoretical grounds193 and emerging empirical evidence.194 Checklists are less frequently used and potentially have the same problems as scales. We advocate using a component approach and one that is based on domains for which there is good empirical evidence and perhaps strong clinical grounds. The new Cochrane risk of bias tool11 is one such component approach. The Cochrane risk of bias tool consists of five items for which there is empirical evidence for their biasing influence on the estimates of an intervention’s effectiveness in randomised trials (sequence generation, allocation concealment, blinding, incomplete outcome data, and selective outcome reporting) and a catch-all item called “other sources of bias”.11 There is also some consensus that these items can be applied for evaluation of studies across diverse clinical areas.93 Other risk of bias items may be topic or even study specific—that is, they may stem from some peculiarity of the research topic or some special feature of the design of a specific study. These peculiarities need to be investigated on a case-by-case basis, based on clinical and methodological acumen, and there can be no general recipe. In all situations, systematic reviewers need to think ahead carefully about what aspects of study quality may have a bearing on the results. Deciding whether to combine data involves statistical, clinical, and methodological considerations. The statistical decisions are perhaps the most technical and evidence-based. These are more thoroughly discussed in box 6. The clinical and methodological decisions are generally based on discussions within the review team and may be more subjective. Clinical considerations will be influenced by the question the review is attempting to address. Broad questions might provide more “license” to combine more disparate studies, such as whether “Ritalin is effective in increasing focused attention in people diagnosed with attention deficit hyperactivity disorder (ADHD).” Here authors might elect to combine reports of studies involving children and adults. If the clinical question is more focused, such as whether “Ritalin is effective in increasing classroom attention in previously undiagnosed ADHD children who have no comorbid conditions,” it is likely that different decisions regarding synthesis of studies are taken by authors. In any case authors should describe their clinical decisions in the systematic review report. Deciding whether to combine data also has a methodological component. Reviewers may decide not to combine studies of low risk of bias with those of high risk of bias (see items 12 and 19). For example, for subjective outcomes, systematic review authors may not wish to combine assessments that were completed under blind conditions with those that were not. For any particular question there may not be a “right” or “wrong” choice concerning synthesis, as such decisions are likely complex. However, as the choice may be subjective, authors should be transparent as to their key decisions and describe them for readers. There is no consensus about whether to use fixed- or random-effects models, and both are in wide use. The following differences have influenced some researchers regarding their choice between them. The random-effects model gives more weight to the results of smaller trials than does the fixed-effect analysis, which may be undesirable as small trials may be inferior and most prone to publication bias. The fixed-effect model considers only within-study variability, whereas the random-effects model considers both within- and between-study variability. This is why a fixed-effect analysis tends to give narrower confidence intervals (that is, provides greater precision) than a random-effects analysis.110 196 199 In the absence of any between-study heterogeneity, the fixed- and random-effects estimates will coincide. In the presence of demonstrable between-study heterogeneity (see below), some consider that the use of a fixed-effect analysis is counterintuitive because their main assumption is violated. Others argue that it is inappropriate to conduct any meta-analysis when there is unexplained variability across trial results. If the reviewers decide not to combine the data quantitatively, a danger is that eventually they may end up using quasi-quantitative rules of poor validity (such as vote counting of how many studies have nominally significant results) for interpreting the evidence. Statistical methods to combine data exist for almost any complex situation that may arise in a systematic review, but one has to be aware of their assumptions and limitations to avoid misapplying or misinterpreting these methods. We expect some variation (inconsistency) in the results of different studies due to chance alone. Variability in excess of that due to chance reflects true differences in the results of the trials, and is called “heterogeneity.” The conventional statistical approach to evaluating heterogeneity is a χ2 test (Cochran’s Q), but it has low power when there are few studies and excessive power when there are many studies.202 By contrast, the I2 statistic quantifies the amount of variation in results across studies beyond that expected by chance and so is preferable to Q.202 203 I2 represents the percentage of the total variation in estimated effects across studies that is due to heterogeneity rather than to chance; some authors consider an I2 value less than 25% as low.202 However, I2 also suffers from large uncertainty in the common situation where only a few studies are available,204 and reporting the uncertainty in I2 (such as 95% confidence interval) may be helpful.145 When there are few studies, inferences about heterogeneity should be cautious. Systematic reviews aim to incorporate information from all relevant studies. The absence of information from some studies may pose a serious threat to the validity of a review. Data may be incomplete because some studies were not published, or because of incomplete or inadequate reporting within a published article. These problems are often summarised as “publication bias,” although the bias arises from non-publication of full studies and selective publication of results in relation to their findings. Non-publication of research findings dependent on the actual results is an important risk of bias to a systematic review and meta-analysis. Also, among published studies, those with statistically significant results are published sooner than those with non-significant findings.209 When some studies are missing for these reasons, the available results will be biased towards exaggerating the effect of an intervention. In many systematic reviews only some of the eligible studies (often a minority) can be included in a meta-analysis for a specific outcome. For some studies, the outcome may not be measured or may be measured but not reported. The former will not lead to bias, but the latter could. Missing studies may increasingly be identified from trials registries. Evidence of missing outcomes may come from comparison with the study protocol, if available, or by careful examination of published articles.11 Study publication bias and selective outcome reporting are difficult to exclude or verify from the available results, especially when few studies are available. The following people contributed to this paper: Doug Altman, Centre for Statistics in Medicine (Oxford, UK); Gerd Antes, University Hospital Freiburg (Freiburg, Germany); David Atkins, Health Services Research and Development Service, Veterans Health Administration (Washington DC, USA); Virginia Barbour, PLoS Medicine (Cambridge, UK); Nick Barrowman, Children’s Hospital of Eastern Ontario (Ottawa, Canada); Jesse A Berlin, Johnson & Johnson Pharmaceutical Research and Development (Titusville NJ, USA); Jocalyn Clark, PLoS Medicine (at the time of writing, BMJ, London); Mike Clarke, UK Cochrane Centre (Oxford, UK) and School of Nursing and Midwifery, Trinity College (Dublin, Ireland); Deborah Cook, Departments of Medicine, Clinical Epidemiology and Biostatistics, McMaster University (Hamilton, Canada); Roberto D’Amico, Università di Modena e Reggio Emilia (Modena, Italy) and Centro Cochrane Italiano, Istituto Ricerche Farmacologiche Mario Negri (Milan, Italy); Jonathan J Deeks, University of Birmingham (Birmingham); P J Devereaux, Departments of Medicine, Clinical Epidemiology and Biostatistics, McMaster University (Hamilton, Canada); Kay Dickersin, Johns Hopkins Bloomberg School of Public Health (Baltimore MD, USA); Matthias Egger, Department of Social and Preventive Medicine, University of Bern (Bern, Switzerland); Edzard Ernst, Peninsula Medical School (Exeter, UK); Peter C Gøtzsche, Nordic Cochrane Centre (Copenhagen, Denmark); Jeremy Grimshaw, Ottawa Hospital Research Institute (Ottawa, Canada); Gordon Guyatt, Departments of Medicine, Clinical Epidemiology and Biostatistics, McMaster University; Julian Higgins, MRC Biostatistics Unit (Cambridge, UK); John P A Ioannidis, University of Ioannina Campus (Ioannina, Greece); Jos Kleijnen, Kleijnen Systematic Reviews (York, UK) and School for Public Health and Primary Care (CAPHRI), University of Maastricht (Maastricht, Netherlands); Tom Lang, Tom Lang Communications and Training (Davis CA, USA); Alessandro Liberati, Università di Modena e Reggio Emilia (Modena, Italy) and Centro Cochrane Italiano, Istituto Ricerche Farmacologiche Mario Negri (Milan, Italy); Nicola Magrini, NHS Centre for the Evaluation of the Effectiveness of Health Care—CeVEAS (Modena, Italy); David McNamee, Lancet (London, UK); David Moher, Ottawa Methods Centre, Ottawa Hospital Research Institute (Ottawa, Canada); Lorenzo Moja, Centro Cochrane Italiano, Istituto Ricerche Farmacologiche Mario Negri; Maryann Napoli, Center for Medical Consumers (New York, USA); Cynthia Mulrow, Annals of Internal Medicine (Philadelphia, Pennsylvania, US); Andy Oxman, Norwegian Health Services Research Centre (Oslo, Norway); Ba’ Pham, Toronto Health Economics and Technology Assessment Collaborative (Toronto, Canada) (at the time of first meeting of the group, GlaxoSmithKline Canada, Mississauga, Canada); Drummond Rennie, University of California San Francisco (San Francisco CA, USA); Margaret Sampson, Children’s Hospital of Eastern Ontario (Ottawa, Canada); Kenneth F Schulz, Family Health International (Durham NC, USA); Paul G Shekelle, Southern California Evidence Based Practice Center (Santa Monica CA, USA); Jennifer Tetzlaff, Ottawa Methods Centre, Ottawa Hospital Research Institute (Ottawa, Canada); David Tovey, Cochrane Library, Cochrane Collaboration (Oxford, UK) (at the time of first meeting of the group, BMJ, London); Peter Tugwell, Institute of Population Health, University of Ottawa (Ottawa, Canada). Lorenzo Moja helped with the preparation and the several updates of the manuscript and assisted with the preparation of the reference list. AL is the guarantor of the manuscript. In order to encourage dissemination of the PRISMA statement, this article is freely accessible on bmj.com and will also be published in PLoS Medicine, Annals of Internal Medicine, Journal of Clinical Epidemiology, and Open Medicine. The authors jointly hold the copyright of this article. For details on further use, see the PRISMA website (www.prisma-statement.org/). Canadian Institutes of Health Research (2006) Randomized controlled trials registration/application checklist (12/2006). Available: http://www.cihr-irsc.gc.ca/e/documents/rct_reg_e.pdf. Accessed 26 May 2009. Young C, Horton R. Putting clinical trials into context. Lancet2005;366:107-108. Dixon E, Hameed M, Sutherland F, Cook DJ, Doig C. Evaluating meta-analyses in the general surgical literature: A critical appraisal. Ann Surg2005;241:450-459. Hemels ME, Vicente C, Sadri H, Masson MJ, Einarson TR. Quality assessment of meta-analyses of RCTs of pharmacotherapy in major depressive disorder. Curr Med Res Opin2004;20:477-484. Jin W, Yu R, Li W, Youping L, Ya L, et al. The reporting quality of meta-analyses improves: A random sampling study. J Clin Epidemiol2008;61:770-775. Moher D, Simera I, Schulz KF, Hoey J, Altman DG. Helping editors, peer reviewers and authors improve the clarity, completeness and transparency of reporting health research. BMC Med2008;6:13. Moher D, Cook DJ, Eastwood S, Olkin I, Rennie D, et al. Improving the quality of reports of meta-analyses of randomised controlled trials: The QUOROM statement. Quality of Reporting of Meta-analyses. Lancet1999;354:1896-1900. Green S, Higgins JPT, Alderson P, Clarke M, Mulrow CD, et al. Chapter 1: What is a systematic review? In: Higgins JPT, Green S, eds. Cochrane handbook for systematic reviews of interventions version 5.0.0 [updated February 2008]. The Cochrane Collaboration, 2008. Available: http://www.cochrane-handbook.org/. Accessed 26 May 2009. Guyatt GH, Oxman AD, Vist GE, Kunz R, Falck-Ytter Y, et al. GRADE: An emerging consensus on rating quality of evidence and strength of recommendations. BMJ2008;336:924-926. Higgins JPT, Altman DG. Chapter 8: Assessing risk of bias in included studies. In: Higgins JPT, Green S, eds. Cochrane handbook for systematic reviews of interventions version 5.0.0 [updated February 2008]. The Cochrane Collaboration, 2008. Available: http://www.cochrane-handbook.org/. Accessed 26 May 2009. Atkins D, Fink K, Slutsky J. Better information for better health care: The Evidence-based Practice Center program and the Agency for Healthcare Research and Quality. Ann Intern Med2005;142:1035-1041. Helfand M, Balshem H. Principles for developing guidance: AHRQ and the effective health-care program. J Clin Epidemiol2009, In press. Higgins JPT, Green S. Cochrane handbook for systematic reviews of interventions version 5.0.0 [updated February 2008]. The Cochrane Collaboration, 2008. Available: http://www.cochrane-handbook.org/. Accessed 26 May 2009. Centre for Reviews and Dissemination. Systematic reviews: CRD’s guidance for undertaking reviews in health care. York: University of York, 2009. Available: http://www.york.ac.uk/inst/crd/systematic_reviews_book.htm. Accessed 26 May 2009. Altman DG, Schulz KF, Moher D, Egger M, Davidoff F, et al. The revised CONSORT statement for reporting randomized trials: Explanation and elaboration. Ann Intern Med2001;134:663-694. Bossuyt PM, Reitsma JB, Bruns DE, Gatsonis CA, Glasziou PP, et al. The STARD statement for reporting studies of diagnostic accuracy: Explanation and elaboration. Clin Chem2003;49:7-18. Barker A, Maratos EC, Edmonds L, Lim E. Recurrence rates of video-assisted thoracoscopic versus open surgery in the prevention of recurrent pneumothoraces: A systematic review of randomised and non-randomised trials. Lancet2007;370:329-335. Bjelakovic G, Nikolova D, Gluud LL, Simonetti RG, Gluud C. Mortality in randomized trials of antioxidant supplements for primary and secondary prevention: Systematic review and meta-analysis. JAMA2007;297:842-857. Bischoff-Ferrari HA, Willett WC, Wong JB, Giovannucci E, Dietrich T, et al. Fracture prevention with vitamin D supplementation: A meta-analysis of randomized controlled trials. JAMA2005;293:2257-2264. Hopewell S, Clarke M, Moher D, Wager E, Middleton P, et al. CONSORT for reporting randomised trials in journal and conference abstracts. Lancet2008;371:281-283. Haynes RB, Mulrow CD, Huth EJ, Altman DG, Gardner MJ. More informative abstracts revisited. Ann Intern Med1990;113:69-76. Mulrow CD, Thacker SB, Pugh JA. A proposal for more informative abstracts of review articles. Ann Intern Med1988;108:613-615. Froom P, Froom J. Deficiencies in structured medical abstracts. J Clin Epidemiol1993;46:591-594. Hartley J. Clarifying the abstracts of systematic literature reviews. Bull Med Libr Assoc2000;88:332-337. Hartley J, Sydes M, Blurton A. Obtaining information accurately and quickly: Are structured abstract more efficient? J Infor Sci1996;22:349-356. Pocock SJ, Hughes MD, Lee RJ. Statistical problems in the reporting of clinical trials. A survey of three medical journals. N Engl J Med1987;317:426-432. Taddio A, Pain T, Fassos FF, Boon H, Ilersich AL, et al. Quality of nonstructured and structured abstracts of original research articles in the British Medical Journal, the Canadian Medical Association Journal and the Journal of the American Medical Association. CMAJ1994;150:1611-1615. Harris KC, Kuramoto LK, Schulzer M, Retallack JE. Effect of school-based physical activity interventions on body mass index in children: A meta-analysis. CMAJ2009;180:719-726. James MT, Conley J, Tonelli M, Manns BJ, MacRae J, et al. Meta-analysis: Antibiotics for prophylaxis against hemodialysis catheter-related infections. Ann Intern Med2008;148:596-605. Counsell C. Formulating questions and locating primary studies for inclusion in systematic reviews. Ann Intern Med1997;127:380-387. Gotzsche PC. Why we need a broad perspective on meta-analysis. It may be crucially important for patients. BMJ2000;321:585-586. Grossman P, Niemann L, Schmidt S, Walach H. Mindfulness-based stress reduction and health benefits. A meta-analysis. J Psychosom Res2004;57:35-43. Brunton G, Green S, Higgins JPT, Kjeldstrøm M, Jackson N, et al. Chapter 2: Preparing a Cochrane review. In: Higgins JPT, Green S, eds. Cochrane handbook for systematic reviews of interventions version 5.0.0 [updated February 2008]. The Cochrane Collaboration, 2008. Available: http://www.cochrane-handbook.org/. Accessed 26 May 2009. Sutton AJ, Abrams KR, Jones DR, Sheldon TA, Song F. Systematic reviews of trials and other studies. Health Technol Assess1998;2:1-276. Ioannidis JP, Rosenberg PS, Goedert JJ, O’Brien TR. Commentary: meta-analysis of individual participants’ data in genetic epidemiology. Am J Epidemiol2002;156:204-210. Stewart LA, Clarke MJ. Practical methodology of meta-analyses (overviews) using updated individual patient data. Cochrane Working Group. Stat Med1995;14:2057-2079. Chan AW, Hrobjartsson A, Haahr MT, Gøtzsche PC, Altman DG. Empirical evidence for selective reporting of outcomes in randomized trials: Comparison of protocols to published articles. JAMA2004;291:2457-2465. Silagy CA, Middleton P, Hopewell S. Publishing protocols of systematic reviews: Comparing what was done to what was planned. JAMA2002;287:2831-2834. Centre for Reviews and Dissemination. Research projects. York: University of York, 2009. Available: http://www.crd.york.ac.uk/crdweb. Accessed 26 May 2009. The Joanna Briggs Institute. Protocols & work in progress, 2009. Available: http://www.joannabriggs.edu.au/pubs/systematic_reviews_prot.php. Accessed 26 May 2009. Bagshaw SM, McAlister FA, Manns BJ, Ghali WA. Acetylcysteine in the prevention of contrast-induced nephropathy: A case study of the pitfalls in the evolution of evidence. Arch Intern Med2006;166:161-166. Biondi-Zoccai GG, Lotrionte M, Abbate A, Testa L, Remigi E, et al. Compliance with QUOROM and quality of reporting of overlapping meta-analyses on the role of acetylcysteine in the prevention of contrast associated nephropathy: Case study. BMJ2006;332:202-209. Sacks HS, Berrier J, Reitman D, Ancona-Berk VA, Chalmers TC. Meta-analyses of randomized controlled trials. N Engl J Med1987;316:450-455. Egger M, Zellweger-Zahner T, Schneider M, Junker C, Lengeler C, et al. Language bias in randomised controlled trials published in English and German. Lancet1997;350:326-329. Gregoire G, Derderian F, Le Lorier J. Selecting the language of the publications included in a meta-analysis: Is there a Tower of Babel bias? J Clin Epidemiol1995;48:159-163. Jüni P, Holenstein F, Sterne J, Bartlett C, Egger M. Direction and impact of language bias in meta-analyses of controlled trials: Empirical study. Int J Epidemiol2002;31:115-123. Moher D, Pham B, Klassen TP, Schulz KF, Berlin JA, et al. What contributions do languages other than English make on the results of meta-analyses? J Clin Epidemiol2000;53:964-972. Hopewell S, McDonald S, Clarke M, Egger M. Grey literature in meta-analyses of randomized trials of health care interventions. Cochrane Database Syst Rev2007;(2):MR000010, doi:10.1002/14651858.MR000010.pub3. Melander H, Ahlqvist-Rastad J, Meijer G, Beermann B. Evidence b(i)ased medicine—Selective reporting from studies sponsored by pharmaceutical industry: review of studies in new drug applications. BMJ2003;326:1171-1173. Sutton AJ, Duval SJ, Tweedie RL, Abrams KR, Jones DR. Empirical assessment of effect of publication bias on meta-analyses. BMJ2000;320:1574-1577. Gotzsche PC. Believability of relative risks and odds ratios in abstracts: Cross sectional study. BMJ2006;333:231-234. Bhandari M, Devereaux PJ, Guyatt GH, Cook DJ, Swiontkowski MF, et al. An observational study of orthopaedic abstracts and subsequent full-text publications. J Bone Joint Surg Am2002;84-A:615-621. Rosmarakis ES, Soteriades ES, Vergidis PI, Kasiakou SK, Falagas ME. From conference abstract to full paper: Differences between data presented in conferences and journals. Faseb J2005;19:673-680. Toma M, McAlister FA, Bialy L, Adams D, Vandermeer B, et al. Transition from meeting abstract to full-length journal article for randomized controlled trials. JAMA2006;295:1281-1287. Saunders Y, Ross JR, Broadley KE, Edmonds PM, Patel S. Systematic review of bisphosphonates for hypercalcaemia of malignancy. Palliat Med2004;18:418-431. Shojania KG, Sampson M, Ansari MT, Ji J, Doucette S, et al. How quickly do systematic reviews go out of date? A survival analysis. Ann Intern Med2007;147:224-233. Bergerhoff K, Ebrahim S, Paletta G. Do we need to consider ‘in process citations’ for search strategies? Ottawa, Ontario, Canada: 12th Cochrane Colloquium, 2-6 October 2004. Available: http://www.cochrane.org/colloquia/abstracts/ottawa/P-039.htm. Accessed 26 May 2009. Zhang L, Sampson M, McGowan J. Reporting of the role of expert searcher in Cochrane reviews. Evid Based Libr Info Pract2006;1:3-16. Turner EH, Matthews AM, Linardatos E, Tell RA, Rosenthal R. Selective publication of antidepressant trials and its influence on apparent efficacy. N Engl J Med2008;358:252-260. Alejandria MM, Lansang MA, Dans LF, Mantaring JB. Intravenous immunoglobulin for treating sepsis and septic shock. Cochrane Database Syst Rev2002;(1):CD001090, doi:10.1002/14651858.CD001090. Golder S, McIntosh HM, Duffy S, Glanville J. Developing efficient search strategies to identify reports of adverse effects in MEDLINE and EMBASE. Health Info Libr J2006;23:3-12. Sampson M, McGowan J, Cogo E, Grimshaw J, Moher D, et al. An evidence-based practice guideline for the peer review of electronic search strategies. J Clin Epidemiol 2009; E-pub 2009 February 18. Flores-Mir C, Major MP, Major PW. Search and selection methodology of systematic reviews in orthodontics (2000-2004). Am J Orthod Dentofacial Orthop2006;130:214-217. Major MP, Major PW, Flores-Mir C. An evaluation of search and selection methods used in dental systematic reviews published in English. J Am Dent Assoc2006;137:1252-1257. Major MP, Major PW, Flores-Mir C. Benchmarking of reported search and selection methods of systematic reviews by dental speciality. Evid Based Dent2007;8:66-70. Shah MR, Hasselblad V, Stevenson LW, Binanay C, O’Connor CM, et al. Impact of the pulmonary artery catheter in critically ill patients: Meta-analysis of randomized clinical trials. JAMA2005;294:1664-1670. Edwards P, Clarke M, DiGuiseppi C, Pratap S, Roberts I, et al. Identification of randomized controlled trials in systematic reviews: Accuracy and reliability of screening records. Stat Med2002;21:1635-1640.
Cooper HM, Ribble RG. Influences on the outcome of literature searches for integrative research reviews. Knowledge1989;10:179-201. Mistiaen P, Poot E. Telephone follow-up, initiated by a hospital-based health professional, for postdischarge problems in patients discharged from hospital to home. Cochrane Database Syst Rev2006(4):CD004510, doi:10.1002/14651858.CD004510.pub3. Jones AP, Remmington T, Williamson PR, Ashby D, Smyth RL. High prevalence but low impact of data extraction and reporting errors were found in Cochrane systematic reviews. J Clin Epidemiol2005;58:741-742. Clarke M, Hopewell S, Juszczak E, Eisinga A, Kjeldstrom M. Compression stockings for preventing deep vein thrombosis in airline passengers. Cochrane Database Syst Rev2006;(2):CD004002, doi:10.1002/14651858.CD004002.pub2. Tramer MR, Reynolds DJ, Moore RA, McQuay HJ. Impact of covert duplicate publication on meta-analysis: A case study. BMJ1997;315:635-640.
von Elm E, Poglia G, Walder B, Tramer MR. Different patterns of duplicate publication: An analysis of articles used in systematic reviews. JAMA2004;291:974-980. Gotzsche PC. Multiple publication of reports of drug trials. Eur J Clin Pharmacol1989;36:429-432. Allen C, Hopewell S, Prentice A. Non-steroidal anti-inflammatory drugs for pain in women with endometriosis. Cochrane Database Syst Rev2005;(4):CD004753, doi:10.1002/14651858.CD004753.pub2. Glasziou P, Meats E, Heneghan C, Shepperd S. What is missing from descriptions of treatment in trials and reviews? BMJ2008;336:1472-1474. Tracz MJ, Sideras K, Bolona ER, Haddad RM, Kennedy CC, et al. Testosterone use in men and its effects on bone health. A systematic review and meta-analysis of randomized placebo-controlled trials. J Clin Endocrinol Metab2006;91:2011-2016. Bucher HC, Hengstler P, Schindler C, Guyatt GH. Percutaneous transluminal coronary angioplasty versus medical treatment for non-acute coronary heart disease: Meta-analysis of randomised controlled trials. BMJ2000;321:73-77. Gluud LL. Bias in clinical intervention research. Am J Epidemiol2006;163:493-501. Pildal J, Hróbjartsson A, Jorgensen KJ, Hilden J, Altman DG, et al. Impact of allocation concealment on conclusions drawn from meta-analyses of randomized trials. Int J Epidemiol2007;36:847-857. Moja LP, Telaro E, D’Amico R, Moschetti I, Coe L, et al. Assessment of methodological quality of primary studies by systematic reviews: Results of the metaquality cross sectional study. BMJ2005;330:1053. Moher D, Jadad AR, Tugwell P. Assessing the quality of randomized controlled trials. Current issues and future directions. Int J Technol Assess Health Care1996;12:195-208. Sanderson S, Tatt ID, Higgins JP. Tools for assessing quality and susceptibility to bias in observational studies in epidemiology: A systematic review and annotated bibliography. Int J Epidemiol2007;36:666-676. Greenland S. Invited commentary: A critical look at some popular meta-analytic methods. Am J Epidemiol1994;140:290-296. Jüni P, Altman DG, Egger M. Systematic reviews in health care: Assessing the quality of controlled clinical trials. BMJ2001;323:42-46. Kunz R, Oxman AD. The unpredictability paradox: Review of empirical comparisons of randomised and non-randomised clinical trials. BMJ1998;317:1185-1190. Balk EM, Bonis PA, Moskowitz H, Schmid CH, Ioannidis JP, et al. 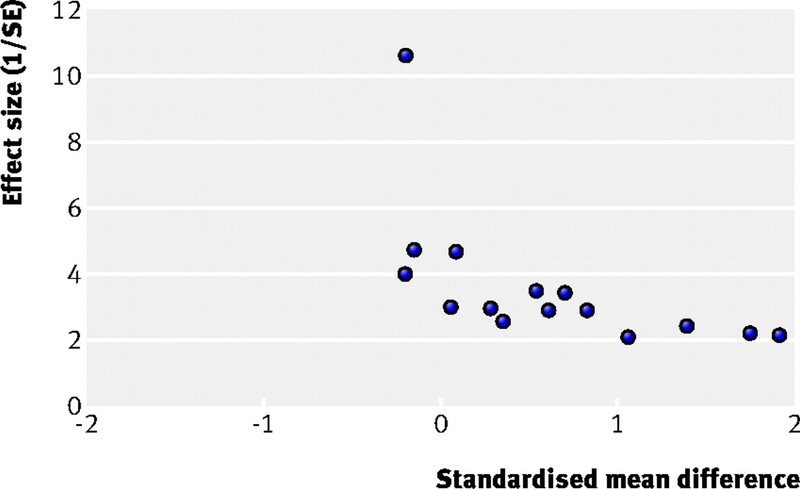 Correlation of quality measures with estimates of treatment effect in meta-analyses of randomized controlled trials. JAMA2002;287:2973-2982. Devereaux PJ, Beattie WS, Choi PT, Badner NH, Guyatt GH, et al. How strong is the evidence for the use of perioperative beta blockers in non-cardiac surgery? Systematic review and meta-analysis of randomised controlled trials. BMJ2005;331:313-321. Devereaux PJ, Bhandari M, Montori VM, Manns BJ, Ghali WA, et al. Double blind, you are the weakest link—Good-bye! ACP J Club2002;136:A11. van Nieuwenhoven CA, Buskens E, van Tiel FH, Bonten MJ. Relationship between methodological trial quality and the effects of selective digestive decontamination on pneumonia and mortality in critically ill patients. JAMA2001;286:335-340. Guyatt GH, Cook D, Devereaux PJ, Meade M, Straus S. Therapy. Users’ guides to the medical literature. AMA Press, 2002:55-79. Sackett DL, Gent M. Controversy in counting and attributing events in clinical trials. N Engl J Med1979;301:1410-1412. Montori VM, Devereaux PJ, Adhikari NK, Burns KE, Eggert CH, et al. Randomized trials stopped early for benefit: A systematic review. JAMA2005;294:2203-2209. Guyatt GH, Devereaux PJ. Therapy and validity: The principle of intention-to-treat. In: Guyatt GH, Rennie DR, eds. Users’ guides to the medical literature. AMA Press, 2002:267-273. Berlin JA. Does blinding of readers affect the results of meta-analyses? University of Pennsylvania Meta-analysis Blinding Study Group. Lancet1997;350:185-186. Jadad AR, Moore RA, Carroll D, Jenkinson C, Reynolds DJ, et al. Assessing the quality of reports of randomized clinical trials: Is blinding necessary? Control Clin Trials1996;17:1-12. Pittas AG, Siegel RD, Lau J. Insulin therapy for critically ill hospitalized patients: A meta-analysis of randomized controlled trials. Arch Intern Med2004;164:2005-2011. Lakhdar R, Al-Mallah MH, Lanfear DE. Safety and tolerability of angiotensin-converting enzyme inhibitor versus the combination of angiotensin-converting enzyme inhibitor and angiotensin receptor blocker in patients with left ventricular dysfunction: A systematic review and meta-analysis of randomized controlled trials. J Card Fail2008;14:181-188. Bobat R, Coovadia H, Stephen C, Naidoo KL, McKerrow N, et al. Safety and efficacy of zinc supplementation for children with HIV-1 infection in South Africa: A randomised double-blind placebo-controlled trial. Lancet2005;366:1862-1867. Deeks JJ, Altman DG. Effect measures for meta-analysis of trials with binary outcomes. In: Egger M, Smith GD, Altman DG, eds. Systematic reviews in healthcare: Meta-analysis in context. 2nd edn. London: BMJ Publishing Group, 2001. Deeks JJ. Issues in the selection of a summary statistic for meta-analysis of clinical trials with binary outcomes. Stat Med2002;21:1575-1600. Engels EA, Schmid CH, Terrin N, Olkin I, Lau J. Heterogeneity and statistical significance in meta-analysis: An empirical study of 125 meta-analyses. Stat Med2000;19:1707-1728. Michiels S, Piedbois P, Burdett S, Syz N, Stewart L, et al. Meta-analysis when only the median survival times are known: A comparison with individual patient data results. Int J Technol Assess Health Care2005;21:119-125. Briel M, Studer M, Glass TR, Bucher HC. Effects of statins on stroke prevention in patients with and without coronary heart disease: A meta-analysis of randomized controlled trials. Am J Med2004;117:596-606. Jones M, Schenkel B, Just J, Fallowfield L. Epoetin alfa improves quality of life in patients with cancer: Results of metaanalysis. Cancer2004;101:1720-1732. Elbourne DR, Altman DG, Higgins JP, Curtin F, Worthington HV, et al. Meta-analyses involving cross-over trials: Methodological issues. Int J Epidemiol2002;31:140-149. Follmann D, Elliott P, Suh I, Cutler J. Variance imputation for overviews of clinical trials with continuous response. J Clin Epidemiol1992;45:769-773. Wiebe N, Vandermeer B, Platt RW, Klassen TP, Moher D, et al. A systematic review identifies a lack of standardization in methods for handling missing variance data. J Clin Epidemiol2006;59:342-353. Hrobjartsson A, Gotzsche PC. Placebo interventions for all clinical conditions. Cochrane Database Syst Rev2004;(2):CD003974, doi:10.1002/14651858.CD003974.pub2. Shekelle PG, Morton SC, Maglione M, Suttorp M, Tu W, et al. Pharmacological and surgical treatment of obesity. Evid Rep Technol Assess (Summ)2004:1-6. Williamson PR, Gamble C. Identification and impact of outcome selection bias in meta-analysis. Stat Med2005;24:1547-1561. Williamson PR, Gamble C, Altman DG, Hutton JL. Outcome selection bias in meta-analysis. Stat Methods Med Res2005;14:515-524. Ioannidis JP, Trikalinos TA. The appropriateness of asymmetry tests for publication bias in meta-analyses: A large survey. CMAJ2007;176:1091-1096. Briel M, Schwartz GG, Thompson PL, de Lemos JA, Blazing MA, et al. Effects of early treatment with statins on short-term clinical outcomes in acute coronary syndromes: A meta-analysis of randomized controlled trials. JAMA2006;295:2046-2056. Song F, Eastwood AJ, Gilbody S, Duley L, Sutton AJ. Publication and related biases. Health Technol Assess2000;4:1-115. Schmid CH, Stark PC, Berlin JA, Landais P, Lau J. Meta-regression detected associations between heterogeneous treatment effects and study-level, but not patient-level, factors. J Clin Epidemiol2004;57:683-697. Higgins JP, Thompson SG. Controlling the risk of spurious findings from meta-regression. Stat Med2004;23:1663-1682. Thompson SG, Higgins JP. Treating individuals 4: Can meta-analysis help target interventions at individuals most likely to benefit? Lancet2005;365:341-346. Uitterhoeve RJ, Vernooy M, Litjens M, Potting K, Bensing J, et al. Psychosocial interventions for patients with advanced cancer—A systematic review of the literature. Br J Cancer2004;91:1050-1062. Fuccio L, Minardi ME, Zagari RM, Grilli D, Magrini N, et al. 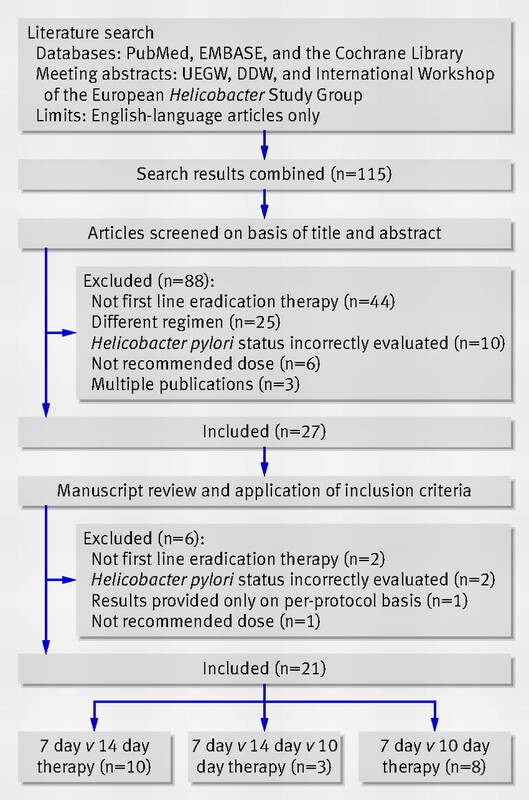 Meta-analysis: Duration of first-line proton-pump inhibitor based triple therapy for Helicobacter pylori eradication. Ann Intern Med2007;147:553-562. Egger M, Smith GD. Bias in location and selection of studies. BMJ1998;316:61-66. Ravnskov U. Cholesterol lowering trials in coronary heart disease: Frequency of citation and outcome. BMJ1992;305:15-19. Hind D, Booth A. Do health technology assessments comply with QUOROM diagram guidance? An empirical study. BMC Med Res Methodol2007;7:49. Curioni C, Andre C. Rimonabant for overweight or obesity. Cochrane Database Syst Rev2006;(4):CD006162, doi:10.1002/14651858.CD006162.pub2. DeCamp LR, Byerley JS, Doshi N, Steiner MJ. 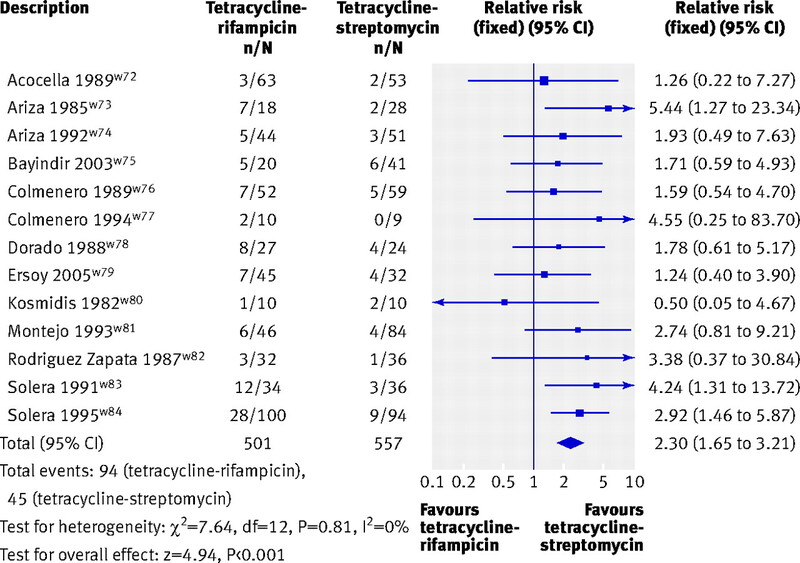 Use of antiemetic agents in acute gastroenteritis: A systematic review and meta-analysis. Arch Pediatr Adolesc Med2008;162:858-865. Pakos EE, Ioannidis JP. Radiotherapy vs. nonsteroidal anti-inflammatory drugs for the prevention of heterotopic ossification after major hip procedures: A meta-analysis of randomized trials. Int J Radiat Oncol Biol Phys2004;60:888-895. Skalsky K, Yahav D, Bishara J, Pitlik S, Leibovici L, et al. Treatment of human brucellosis: Systematic review and meta-analysis of randomised controlled trials. BMJ2008;336:701-704. Altman DG, Cates C. The need for individual trial results in reports of systematic reviews. BMJ2001. Rapid response. Gotzsche PC, Hrobjartsson A, Maric K, Tendal B. Data extraction errors in meta-analyses that use standardized mean differences. JAMA2007;298:430-437. Lewis S, Clarke M. Forest plots: Trying to see the wood and the trees. BMJ2001;322:1479-1480. Papanikolaou PN, Ioannidis JP. Availability of large-scale evidence on specific harms from systematic reviews of randomized trials. Am J Med2004;117:582-589. Duffett M, Choong K, Ng V, Randolph A, Cook DJ. Surfactant therapy for acute respiratory failure in children: A systematic review and meta-analysis. Crit Care2007;11:R66. Balk E, Raman G, Chung M, Ip S, Tatsioni A, et al. Effectiveness of management strategies for renal artery stenosis: A systematic review. Ann Intern Med2006;145:901-912. Palfreyman S, Nelson EA, Michaels JA. Dressings for venous leg ulcers: Systematic review and meta-analysis. BMJ2007;335:244. Ioannidis JP, Patsopoulos NA, Evangelou E. Uncertainty in heterogeneity estimates in meta-analyses. BMJ2007;335:914-916. Appleton KM, Hayward RC, Gunnell D, Peters TJ, Rogers PJ, et al. Effects of n-3 long-chain polyunsaturated fatty acids on depressed mood: systematic review of published trials. Am J Clin Nutr2006;84:1308-1316. Reichenbach S, Sterchi R, Scherer M, Trelle S, Burgi E, et al. Meta-analysis: Chondroitin for osteoarthritis of the knee or hip. Ann Intern Med2007;146:580-590. Hodson EM, Craig JC, Strippoli GF, Webster AC. Antiviral medications for preventing cytomegalovirus disease in solid organ transplant recipients. Cochrane Database Syst Rev2008;(2):CD003774, doi:10.1002/14651858.CD003774.pub3. Thompson SG, Higgins JP. How should meta-regression analyses be undertaken and interpreted? Stat Med2002;21:1559-1573. Chan AW, Krleza-Jeric K, Schmid I, Altman DG. Outcome reporting bias in randomized trials funded by the Canadian Institutes of Health Research. CMAJ2004;171:735-740. Hahn S, Williamson PR, Hutton JL, Garner P, Flynn EV. Assessing the potential for bias in meta-analysis due to selective reporting of subgroup analyses within studies. Stat Med2000;19:3325-3336. Green LW, Glasgow RE. Evaluating the relevance, generalization, and applicability of research: Issues in external validation and translation methodology. Eval Health Prof2006;29:126-153. Liberati A, D’Amico R, Pifferi, Torri V, Brazzi L. Antibiotic prophylaxis to reduce respiratory tract infections and mortality in adults receiving intensive care. Cochrane Database Syst Rev2004;(1):CD000022, doi:10.1002/14651858.CD000022.pub2. Gonzalez R, Zamora J, Gomez-Camarero J, Molinero LM, Banares R, et al. Meta-analysis: Combination endoscopic and drug therapy to prevent variceal rebleeding in cirrhosis. Ann Intern Med2008;149:109-122. D’Amico R, Pifferi S, Leonetti C, Torri V, Tinazzi A, et al. Effectiveness of antibiotic prophylaxis in critically ill adult patients: Systematic review of randomised controlled trials. BMJ1998;316:1275-1285. Olsen O, Middleton P, Ezzo J, Gotzsche PC, Hadhazy V, et al. Quality of Cochrane reviews: Assessment of sample from 1998. BMJ2001;323:829-832. Hopewell S, Wolfenden L, Clarke M. Reporting of adverse events in systematic reviews can be improved: Survey results. J Clin Epidemiol2008;61:597-602. Cook DJ, Reeve BK, Guyatt GH, Heyland DK, Griffith LE, et al. Stress ulcer prophylaxis in critically ill patients. Resolving discordant meta-analyses. JAMA1996;275:308-314. Jadad AR, Cook DJ, Browman GP. A guide to interpreting discordant systematic reviews. CMAJ1997;156:1411-1416. Clarke L, Clarke M, Clarke T. How useful are Cochrane reviews in identifying research needs? J Health Serv Res Policy2007;12:101-103. [No authors listed]. World Medical Association Declaration of Helsinki: Ethical principles for medical research involving human subjects. JAMA2000;284:3043-3045. Clarke M, Hopewell S, Chalmers I. Reports of clinical trials should begin and end with up-to-date systematic reviews of other relevant evidence: A status report. J R Soc Med2007;100:187-190. Dube C, Rostom A, Lewin G, Tsertsvadze A, Barrowman N, et al. The use of aspirin for primary prevention of colorectal cancer: A systematic review prepared for the U.S. Preventive Services Task Force. Ann Intern Med2007;146:365-375. Critchley J, Bates I. Haemoglobin colour scale for anaemia diagnosis where there is no laboratory: A systematic review. Int J Epidemiol2005;34:1425-1434. Lexchin J, Bero LA, Djulbegovic B, Clark O. Pharmaceutical industry sponsorship and research outcome and quality: Systematic review. BMJ2003;326:1167-1170. Als-Nielsen B, Chen W, Gluud C, Kjaergard LL. Association of funding and conclusions in randomized drug trials: A reflection of treatment effect or adverse events? JAMA2003;290:921-928. Peppercorn J, Blood E, Winer E, Partridge A. Association between pharmaceutical involvement and outcomes in breast cancer clinical trials. Cancer2007;109:1239-1246. Yank V, Rennie D, Bero LA. Financial ties and concordance between results and conclusions in meta-analyses: Retrospective cohort study. BMJ2007;335:1202-1205. Jorgensen AW, Hilden J, Gøtzsche PC. Cochrane reviews compared with industry supported meta-analyses and other meta-analyses of the same drugs: Systematic review. BMJ2006;333:782. Akbari A, Mayhew A, Al-Alawi M, Grimshaw J, Winkens R, et al. Interventions to improve outpatient referrals from primary care to secondary care. Cochrane Database of Syst Rev2008;(2):CD005471, doi:10.1002/14651858.CD005471.pub2. Davies P, Boruch R. The Campbell Collaboration. BMJ2001;323:294-295. Pawson R, Greenhalgh T, Harvey G, Walshe K. Realist review—A new method of systematic review designed for complex policy interventions. J Health Serv Res Policy2005;10(Suppl 1):21-34. Greenhalgh T, Robert G, Macfarlane F, Bate P, Kyriakidou O, et al. Storylines of research in diffusion of innovation: A meta-narrative approach to systematic review. Soc Sci Med2005;61:417-430. Lumley T. Network meta-analysis for indirect treatment comparisons. Stat Med2002;21:2313-2324. Altman DG, Moher D. [Developing guidelines for reporting healthcare research: scientific rationale and procedures.]. Med Clin (Barc)2005;125(Suppl 1):8-13. Delaney A, Bagshaw SM, Ferland A, Manns B, Laupland KB, et al. A systematic evaluation of the quality of meta-analyses in the critical care literature. Crit Care2005;9:R575-582. Altman DG, Simera I, Hoey J, Moher D, Schulz K. EQUATOR: Reporting guidelines for health research. Lancet2008;371:1149-1150. Plint AC, Moher D, Morrison A, Schulz K, Altman DG, et al. Does the CONSORT checklist improve the quality of reports of randomised controlled trials? A systematic review. Med J Aust2006;185:263-267. Last JM. A dictionary of epidemiology. Oxford: Oxford University Press & International Epidemiological Association, 2001. Antman EM, Lau J, Kupelnick B, Mosteller F, Chalmers TC. A comparison of results of meta-analyses of randomized control trials and recommendations of clinical experts. Treatments for myocardial infarction. JAMA1992;268:240-248. Oxman AD, Guyatt GH. The science of reviewing research. Ann N Y Acad Sci1993;703:125-133; discussion 133-124. O’Connor D, Green S, Higgins JPT. Chapter 5: Defining the review question and developing criteria for including studies. In: Higgins JPT, Green S, editors. Cochrane handbook for systematic reviews of interventions version 5.0.0 [updated February 2008]. The Cochrane Collaboration, 2008. Available: http://www.cochrane-handbook.org/. Accessed 26 May 2009. McDonagh M, Whiting P, Bradley M, Cooper J, Sutton A, et al. A systematic review of public water fluoridation. Protocol changes (Appendix M). NHS Centre for Reviews and Dissemination. York: University of York, 2000. Available: http://www.york.ac.uk/inst/crd/pdf/appm.pdf.. Accessed 26 May 2009. Moher D, Cook DJ, Jadad AR, Tugwell P, Moher M, et al. Assessing the quality of reports of randomised trials: Implications for the conduct of meta-analyses. Health Technol Assess1999;3:i-iv, 1-98. Devereaux PJ, Choi PT, El-Dika S, Bhandari M, Montori VM, et al. An observational study found that authors of randomized controlled trials frequently use concealment of randomization and blinding, despite the failure to report these methods. J Clin Epidemiol2004;57:1232-1236. Soares HP, Daniels S, Kumar A, Clarke M, Scott C, et al. Bad reporting does not mean bad methods for randomised trials: Observational study of randomised controlled trials performed by the Radiation Therapy Oncology Group. BMJ2004;328:22-24. Liberati A, Himel HN, Chalmers TC. A quality assessment of randomized control trials of primary treatment of breast cancer. J Clin Oncol1986;4:942-951. Moher D, Jadad AR, Nichol G, Penman M, Tugwell P, et al. Assessing the quality of randomized controlled trials: An annotated bibliography of scales and checklists. Control Clin Trials1995;16:62-73. Greenland S, O’Rourke K. On the bias produced by quality scores in meta-analysis, and a hierarchical view of proposed solutions. Biostatistics2001;2:463-471. Jüni P, Witschi A, Bloch R, Egger M. The hazards of scoring the quality of clinical trials for meta-analysis. JAMA1999;282:1054-1060. Fleiss JL. The statistical basis of meta-analysis. Stat Methods Med Res1993;2:121-145. Villar J, Mackey ME, Carroli G, Donner A. Meta-analyses in systematic reviews of randomized controlled trials in perinatal medicine: Comparison of fixed and random effects models. Stat Med2001;20:3635-3647. Lau J, Ioannidis JP, Schmid CH. Summing up evidence: One answer is not always enough. Lancet1998;351:123-127. DerSimonian R, Laird N. Meta-analysis in clinical trials. Control Clin Trials1986;7:177-188. Hunter JE, Schmidt FL. Fixed effects vs. random effects meta-analysis models: Implications for cumulative research knowledge. Int J Sel Assess2000;8:275-292. Deeks JJ, Altman DG, Bradburn MJ. Statistical methods for examining heterogeneity and combining results from several studies in meta-analysis. In: Egger M, Davey Smith G, Altman DG, eds. Systematic reviews in healthcare: Meta-analysis in context. London: BMJ Publishing Group, 2001:285-312. Warn DE, Thompson SG, Spiegelhalter DJ. Bayesian random effects meta-analysis of trials with binary outcomes: Methods for the absolute risk difference and relative risk scales. Stat Med2002;21:1601-1623. Higgins JP, Thompson SG, Deeks JJ, Altman DG. Measuring inconsistency in meta-analyses. BMJ2003;327:557-560. Higgins JP, Thompson SG. Quantifying heterogeneity in a meta-analysis. Stat Med2002;21:1539-1558. Huedo-Medina TB, Sanchez-Meca J, Marin-Martinez F, Botella J. Assessing heterogeneity in meta-analysis: Q statistic or I2 index? Psychol Methods2006;11:193-206. Thompson SG, Turner RM, Warn DE. Multilevel models for meta-analysis, and their application to absolute risk differences. Stat Methods Med Res2001;10:375-392. Dickersin K. Publication bias: Recognising the problem, understanding its origin and scope, and preventing harm. In: Rothstein HR, Sutton AJ, Borenstein M, eds. Publication bias in meta-analysis—Prevention, assessment and adjustments. West Sussex: John Wiley & Sons, 2005:356. Scherer RW, Langenberg P, von Elm E. Full publication of results initially presented in abstracts. Cochrane Database Syst Rev2007;(2):MR000005, doi:10.1002/14651858.MR000005.pub3. Krzyzanowska MK, Pintilie M, Tannock IF. Factors associated with failure to publish large randomized trials presented at an oncology meeting. JAMA2003;290:495-501. Hopewell S, Clarke M. Methodologists and their methods. Do methodologists write up their conference presentations or is it just 15 minutes of fame? Int J Technol Assess Health Care2001;17:601-603. Ghersi D. Issues in the design, conduct and reporting of clinical trials that impact on the quality of decision making. PhD thesis. Sydney: School of Public Health, Faculty of Medicine, University of Sydney, 2006.
von Elm E, Rollin A, Blumle A, Huwiler K, Witschi M, et al. Publication and non-publication of clinical trials: Longitudinal study of applications submitted to a research ethics committee. Swiss Med Wkly2008;138:197-203. Sterne JA, Egger M. Funnel plots for detecting bias in meta-analysis: guidelines on choice of axis. J Clin Epidemiol2001;54:1046-1055. Harbord RM, Egger M, Sterne JA. A modified test for small-study effects in meta-analyses of controlled trials with binary endpoints. Stat Med2006;25:3443-3457. Peters JL, Sutton AJ, Jones DR, Abrams KR, Rushton L. Comparison of two methods to detect publication bias in meta-analysis. JAMA2006;295:676-680. Rothstein HR, Sutton AJ, Borenstein M. Publication bias in meta-analysis: Prevention, assessment and adjustments. West Sussex: John Wiley & Sons, 2005. Egger M, Davey Smith G, Schneider M, Minder C. Bias in meta-analysis detected by a simple, graphical test. BMJ1997;315:629-634. Ioannidis JP, Trikalinos TA. An exploratory test for an excess of significant findings. Clin Trials2007;4:245-253. Sterne JAC, Egger M, Moher D. Chapter 10: Addressing reporting biases. In: Higgins JPT, Green S, eds. Cochrane handbook for systematic reviews of interventions version 5.0.0 [updated February 2008]. The Cochrane Collaboration, 2008. Available: http://www.cochrane-handbook.org/. Accessed 26 May 2009.